Cars and Electronic Trading; what do they have in common? 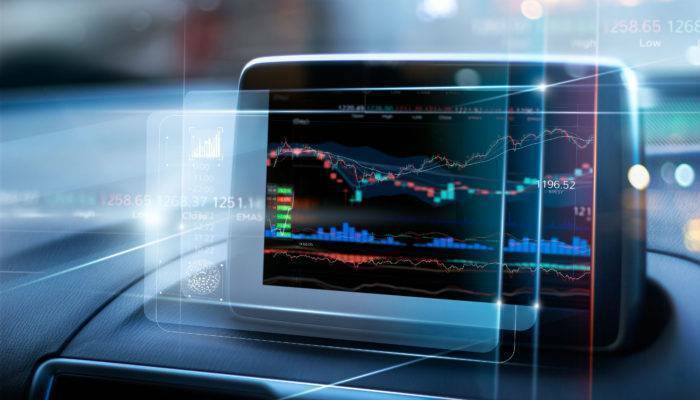 What do the Audi Q7 & Q8, the Bentley Bentayga, the Lamborghini Urus, Porsche Cayenne, and Volkswagen Touareg have in common and what are the parallels to the world of Electronic Trading? The answer is platform engineering. The design and manufacturing of cars is an expensive business, and there are many non-differentiating components in that process that are expensive to research and develop. The chassis or floor plan that the engine, suspension, brakes and body are bolted onto is one such component. The large car companies therefore develop these either across their entire range of brands or in conjunction with other marques. There is a plethora of examples where this is the case e.g. the models above all share the same co-developed chassis and are all built in Slovakia with the final assembly in Lepizig. Another example from outside the VW Audi group is the Fiat 500X and the Jeep Renegade that are also developed on the same platform. Moreover, platform sharing goes far beyond creating variations of the same car in the same country as both Chrysler and Mercedes share components today. The motivation for this component sharing is simple – time and money. The cost to engineer parts for a mass-produced vehicle can run into billions of pounds, and by spreading the cost over several product lines it’s much easier to sell your products at an attractive price and still make a profit. In other words, achieving economies of scale. The same is true in the electronic trading industry, where many banks create their own electronic trading infrastructure software and then deploy their differentiating intellectual property either on top of it or as a tightly coupled part of it. 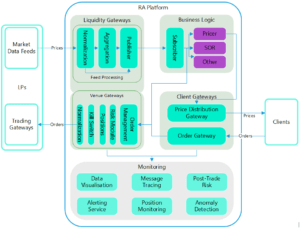 Rapid Addition knows that RA Hub and RA Monitor, along with its various component parts deliver a platform for any electronic trading industry process. RA Hub and RA Monitor represent the common chassis, or core platform that is deployed across all implementations, and components such as our market adaptors, client FIX gateways, algorithmic trading framework, or FPGA sponsored access risk modules are the components that are shared among applications (or cars). Each electronic trading business is different and has different requirements but there will always be a requirement for a common messaging platform and for the monitoring of the electronic trading activity that is happening on it. An example of how RA’s platform can be used in the FX industry, for example, is shown in this diagram here. Like a car platform RA’s Hub and Monitor offering consists of a core chassis (RA Hub) that provides the core of any electronic trading process deployment. And then a series of components are added to provide each distinct offering or model. With a car platform, things like interior, engine, suspension, brakes; in an electronic trading business, things like algorithms, smart order routers and pricing engines. Most of the RA platform is common to all clients, but clients can configure or deploy their differentiating business logic into any of the boxes within the RA Platform. Non differentiating services can be utilized to significantly accelerate implementation of the differentiating business logic (e.g. the Algorithms and SOR (Smart Order Routing) framework, risk module, disaster recovery, persistence, fail over, replication, middleware and JDBC adapters, market data / aggregation / fanout module, encoding framework, native connectivity framework, FPGA acceleration and FIX state management). In addition, utilizing the monitoring framework including advanced data visualization and alerting features, load balancing tools, and a distributed deployment framework completes the solution. Financial institutions using the RA Electronic Trading Platform are mixing and matching the components according to their business objectives in the same way that car companies do for financial reward as a result all users of the RA Electronic Trading Platform enjoy reduced Total Cost of Ownership (TCO) and by reducing costs increase the Return on Equity (ROE) produced for shareholders by the banks electronic trading activities. The range of examples where Financial Institutions have deployed RA’s Electronic Trading Platform covers our whole industry from Tier 1 investment banks using us to distribute their global FX and FICC prices to Tier 1 Buy Side Institutions using us to align their various OMS’s, Investment Banks using us to monitor and control risk globally and so on. Writing this article has made the author think about the industrial revolution and the state of our industry, and I’ll be exploring that theme in my next blog.